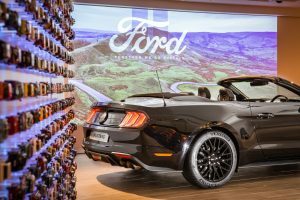 Automotive retail makes another bold move as Ford open their new Digital FordStore set within the Next Arndale flagship store- designed by London creative agency Dalziel & Pow. Occupying a prominent position, this concept has been designed with different customer journeys in mind – from day tripping families to trend-conscious millennials, to existing customers seeking an upgrade or passers-by new to Ford. This experience allows consumers to explore independently or take advantage of support from Ford ‘Hosts’ – approachable and knowledgeable staff, guided by the core principles of inclusivity, empowerment and simplicity. A Disrupt zone in the store’s threshold immediately attracts attention with its nine-metre-high digital screen, acting as dynamic signage and a transition from Next to Ford. Further inside, the Educate zone demonstrates how to select and personalise the perfect model according to a customer’s needs. 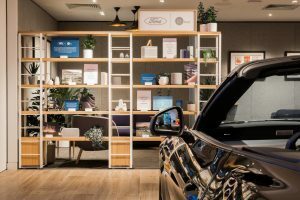 The Consult area is a canvas for brand storytelling, highlighting the benefits of Ford and allowing customers to explore product specifications and information within a lounge space, access to free Wi-Fi and phone-charging. Designed to feel welcoming, open and warm, the interior features natural finishes and domestic touches such potted plants, pendant lamps and artworks; all complementing the Next concept, again designed by Dalziel & Pow. Ford has been using renewable, plant-based materials innovatively since the 1930s, including utilising soy, denim and recycled bottles in its manufacturing process. These eco credentials are tangibly communicated in the space via storytelling and artefacts that act as a ‘mini museum’. Further immersing customers in the brand’s world, there are inspirational Henry Ford quotes and archive issues of Time magazine featuring Ford. 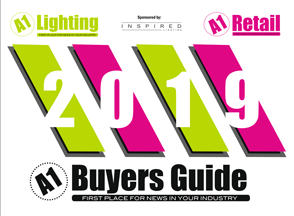 Alongside five display vehicles, a focal point is the kaleidoscopic ‘light’ made from a collection of miniature car models that light up and ‘move’ as customers pass by. Around the space, digital screens play brand content, campaigns and messages as well as footage inspiring customers to explore Manchester and its surroundings by car. 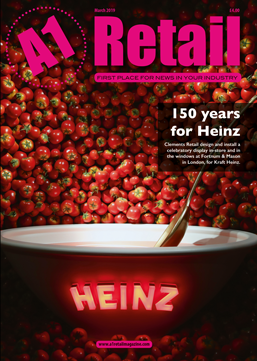 This content can be refreshed regularly with new product launches or campaigns. Similarly, the flexible design enables Ford to easily host social events, product events or launch takeovers. 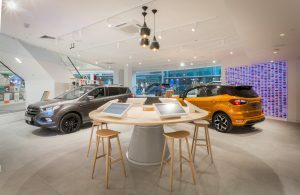 Telling Ford’s story in this intuitive and collaborative space, Dalziel & Pow continues its longstanding collaboration with both Rockar and Next, and further innovates the car retail experience.